Senator Al Franken (left) and Betsy DeVos. Betsy DeVos can’t say that went well. President-elect Donald Trump’s nominee for Education secretary had a contentious confirmation hearing on Tuesday with Democratic senators zeroing in on her lack of experience in the education field. 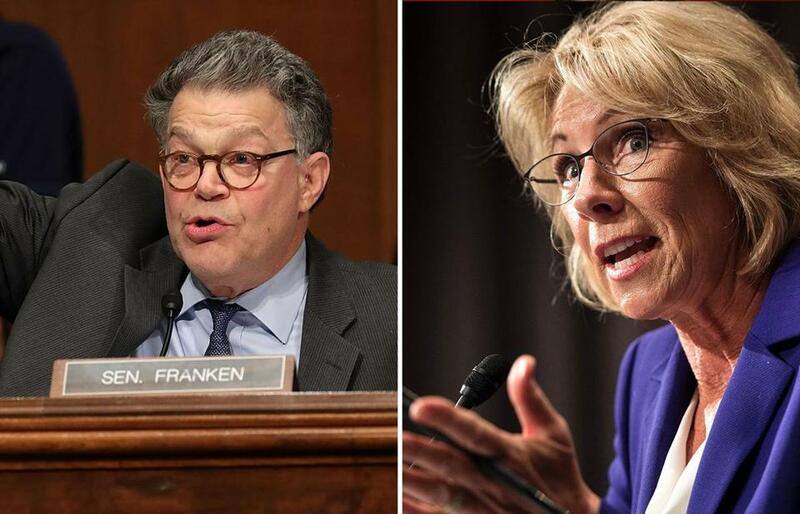 Senator Al Franken, a Democrat from Minnesota, delivered one of the biggest blows to DeVos when he asked her for views on using testing to measure growth or profiency. “I think, if I’m understanding your question correctly around proficiency, I would also correlate it to competency and mastery, so that each student is measured according to the advancement they’re making in each subject area,” DeVos said. DeVos said she was “just asking to clarify,” shocking Franken and prompting him to go on the offensive. The issue of proficiency versus growth is an important one in education policy, particularly when it comes to the issue of standardized tests. Proficiency measures whether students are hitting specific benchmarks for their grade level, while growth is about the academic progress children achieve — or do not. The next secretary of the Education Department will weigh in on this debate, writing the education rules of the incoming administration. The secretary will also have influence over President-elect Trump’s priorities when it comes to education. DeVos, a high-level Republican donor from Michigan, has been an advocate of charter schools and “school choice,” but she has never worked in public education and neither she nor her children have attended public schools. Aimee Ortiz can be reached at aimee.ortiz@globe.com. Follow her on Twitter @aimee_ortiz. Nicole Hernandez can be reached at nicole.hernandez@globe.com. Follow her on Twitter@NRHSJax.